It’s time to explore! Cool pine forests, cozy little Gold Rush towns, rowdy whitewater rivers, ancient Native American ceremonies, mysterious caves and relaxing campgrounds are all enough to lure northern California families on easy one- or two-day trips.With attention to pacing and planning, family-friendly adventures can be great fun for all ages. First, any outing should include plenty of food, restroom and just run-and-stretch stops. And, although there’s plenty to do in the foothills, it’s important not to over-schedule; one or two destinations are enough for the day. Finally, kids learn with all their senses, so any adventure that includes hands-on activities makes for a memorable, fun outing. 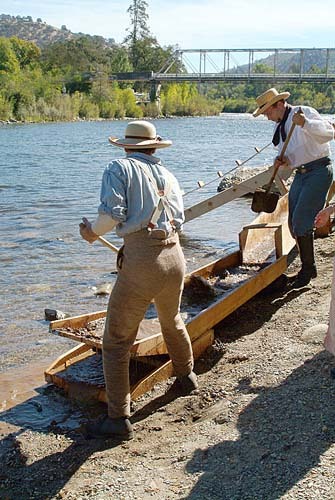 In Coloma, docents demonstrate an old-fashioned Long Tom, used to gather gold during the California Gold Rush. We're the premier website for information about the Sierra Nevada foothills, a beautiful region east of Sacramento in northern California. We roughly cover the area from Nevada County south to Tuolumne County. In the 160 or so pages on this site, you'll find extensive information, whether you're a visitor or you already live here. And enjoy the many beautiful photographs and maps!